Meier Orthopedic Sports and Regenerative Medicine is ideally located for both local and out-of-town patients looking to recover from orthopedic surgery. 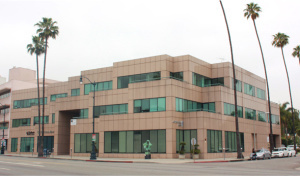 MOSM is primely located in the heart of world class shopping, dining, hotels, and entertainment in Beverly Hills. We accommodate all prospective patients from around the world. This out of town section on our website helps to offer assistance in making travel arrangements to our clinics, as well as finding the best place to recover after surgery. Below you will find many resources to aid you and your loved ones in your visit to Beverly Hills. Located just 30 minutes from Los Angeles International Airport (LAX), and only 40 minutes from Burbank Bob Hope Airport (BUR). MOSM has gone the extra step to ensure relationships are in place which can help our patients from across the United States and around the world make seamless travel arrangements to Beverly Hills. Please review the various business listings throughout this page and contact them at the numbers provided for setting up travel arrangements. Turn Right onto Vanowen St.
Rates start at $55 plus tax and tip for the surrounding area of Beverly Hills. Please contact them to obtain an exact quote for your origin and destination. Skype/ Phone consultations and electronic paperwork/ forms for patients residing outside of the greater Los Angeles area: A fee of $350 will apply for these skype/phone consultations. If you decide to move forward with a regenerative injection procedure, the cost will be applied to the treatment cost. Prior to setting up a Skype/Phone consult, payment is needed 7 days in advance along with all necessary imaging and/or pertinent medical records sent to our office. Additionally, we need to receive complete patient forms which may be either scanned or faxed back to us at 310-247-0342 prior to the Skype/phone consult taking place. Accommodations – MOSM maintains relationships with various hotels in the area. We may assist each patient to find the ideal accommodations for their stay. Please refer to some of the hotels listed below for guidance on where to stay and obtain some rest and relaxation while visiting Southern California and Beverly Hills. In addition to a long list of top of the line hotels and resorts, Beverly Hills is also home to Pearl Recovery Retreat, a state of the art surgery recovery center for patients recovering from orthopedic surgery. Affiliated with the SLS Hotel Beverly Hills, Pearl Recovery Retreat is equipped to offer surgery recovery services, luxury amenities, and spa services for local and international guests simply looking to indulge in a little pampering and rejuvenation. Patients and their families are able to enjoy their hotel stay while also having a nurse assist in their recovery. Beverly Hills has long been the home of some of the most exclusive and inventive restaurants in the world. In recent years, the Los Angeles area has established itself as one of the top culinary destinations in the world. Visitors are able to enjoy cuisine from across the globe with the city’s eclectic mix of international influences and communities. Whether you live in Santa Monica or Dubai, Meier Orthopedic Sports and Regenerative Medicine can help you take the stress and worry out of making orthopedic surgery arrangements. Contact Meier Orthopedic Sports and Regenerative Medicine Today! Are you an international patient looking to making arrangements for orthopedic surgery in Los Angeles? Contact us at 310.777.7845 today to schedule a consultation or appointment, or make a reservation online. Next, read our orthopedic surgery patient reviews.